. 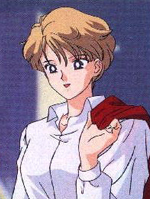 : Lunar Palace v.5 - Japanese: Sailor Uranus :. Dislikes: Making confessions of love. Popular men. According to Uranus and Neptune, Sailor Moon is the true Messiah. Before Uranus and Neptune departed they had to challenge Sailor Moon. They were grateful that Sailor Moon showed her great power at the last second and therefore they felt that the princess was as good as they suspected. Uranus and Neptune have completed their mission, they found the true Messiah and the earth was saved. "Those days I wanted to be like the wind, escaping the force of gravity and disappearing into the sky. I wanted to make myself like that. In any kind of sports nobody could beat me. I was not ready to accept being a soldier, because I knew that once I did, everything would change.